discharge and due to bleeding, anaemia. The cause of Fibroids is unknown. One view is that Fibroids are a toxic condition whereby the body attempts to wall off waste in a place which is not life threatening to the individual. The sluggishness of the lymphatic system allowing toxic material to accumulate and hormonal imbalance with Oestrogen being in excess causes Fibroids. 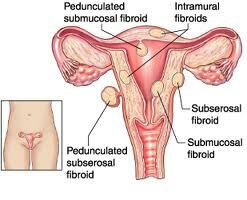 Life style factors also contribute a lot in the cause of Fibroids. Penduculated fibroids can be attached either to the inside or outside wall of the womb, and they are characterised by a stalk like attachment. Small fibroids may not need any treatment although they should be checked on a regular basis. Doctors treat large and actively growing fibroids mostly through surgery and drugs. Fortunately fibroids are almost never malignant. In most cases, surgery can be avoided through natural therapies like Homeopathy. Homeopathy has the ability to treat fibroids exceptionally well by not only enabling the shrinkage of the fibroid but by also changing the tendency of the body to prevent further recurrence in the future. Homeopathic medicines control bleeding quickly and controls the hormone levels. It also helps balance the body’s oestrogen and progesterone and relieves the combination symptoms. Women suffering from Fibroids should avoid oral contraceptives with high oestrogen content and foods like alcohol, caffeine, Fennel seeds and Licorice. Foods good for you would be red clover, vitamin c for immunity and iron absorption and diets that do not promote excess body fat (because Oestrogen is produced by body fat). Previously it was a matter of general practice to remove fibroids surgically if the uterus was enlarged to the same extent it would be in the twelfth week of pregnancy. Increasingly now, physicians are becoming reluctant to remove fibroids solely on the basis of the ‘twelve week rule’unless they are causing medical problems. Fibroids usually shrink with the onset of menopause. Hence the condition may take care of itself over time. Homeopathic medicines can be used for promoting a natural shrinkage of the fibroids and also for prevention of further recurrance. Important tips: High stress levels and excess weight together increase the risk of fibroids. Improving any of these factors will decrease the risk of fibroids. A woman’s chance of developing fibroids may be decreased if she avoids using oral contraceptives. Homeopathic remedies such as Thuja and Aurum Muriatricum (Gold Chloride) are some of the Homeopathic prescriptions widely known to help Fibroids. But as discussed in earlier articles homeopathic remedies should be selected with an individualistic approach for the best possible results. Do not remain untreated from an ailment only because you do not know that it is actually treatable with holistic natural therapies like Homeopathy. They offer amazing treatment for most chronic and recurring ailments.